Excerpt from Gameworlds: virtual media and children’s everyday play, 79-85. S: What kind of Pokémon is that? A: Just a Pokémon. Either he is so engrossed in the creation of the creature that he is simply deflecting my question, or there is a creation happening here that is not to do with the specificity of the media text and characters. I suspect the latter. Pokémon is so integral to the ecology of the boys’ material and imaginary lives at this point that ‘Pokémon’ could simply function as the rationale for beginning to draw, a spell to invoke the gameworld into existence on the paper. The imaginary world, if that’s not putting it too strongly at this point, is vocalized through a loose repertoire of sing-song words and phrases. A (quietly): Who’s going to win the world? World champion … Whoa, it’s metal things. At this point the drawing mode shifts up a gear. The ‘metal things’ appear as Alex has picked up a silver wax crayon. He draws more quickly, a spiralling scribble over an area of already intense overlaid scribbles of different colours. A: Look at these metal things. One of them’s destroying … (he traces a silver line carefully along a figure drawn earlier across the top of the paper – something like a worm or spine). A: They’re giving their attack to another one (fierce scribbling now). You know what, this one just went skrwerch! and scribbled everything! Even its attacks! The plastic arts are always a coming together of ideas and aesthetic conventions with the material possibilities of the media: marks, colour, pattern, shape and so on. Felt-tipped pens set out clean, definite lines and edges, whilst wax crayons allow – and hence suggest – overlaying meshes of scribbles. 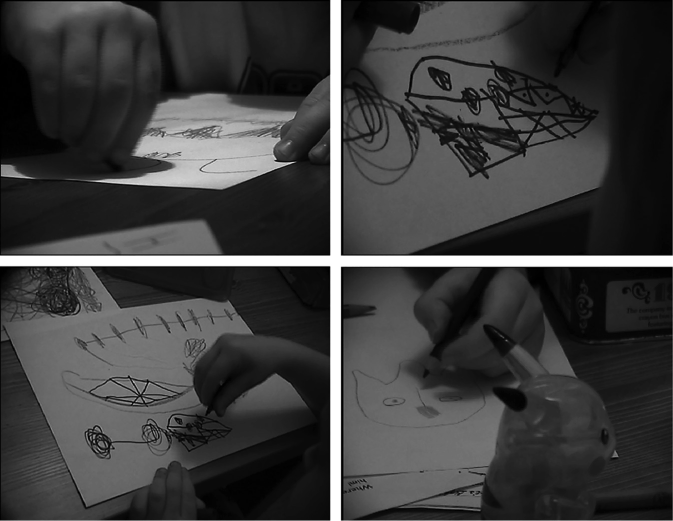 The moment and action of drawing and the marks on the paper become the action itself: the actualization of the creatures’ magical attacks like ectoplasm in a Victorian séance photograph (Figure 4.1). Scribbles are at one moment the representation of an attack (attacks depicted in the Pokémon games and comics as graphic lines of power, force and affect), and with a skrwerch, a crayon counter-attack – a meta-attack. He turns the paper over, and – calm again – with a black pen traces large letter- like shapes. Capital W, M, a mirrored N. Then a jagged little figure with a dot in each spike on its body. A (concentrating on the paper, but addressing me now, albeit absent-mindedly): Do you know what has two eyes? These are just lines. He is conjuring up a fish-like creature, a large body – segmented, with a dot carefully placed in each segment. A (pointing at a line he has just drawn): That is not its mouth – that’s a line. Look at that whale one. S: Errr … Water? A: Colourless! A: This one has a bandage on its tail (he scribbles over the tail with his silver crayon). A (talking to his drawing): You should do attacks what I do, what I say you should do. That Pokémon, that’s what they’re allowed to do. They can do it their-selves. That night Alex read his picture to me in bed as a bedtime story. I didn’t video record this, and don’t recall the details, but readings of this sort were generally a series of events and moments of action and combat traced with his finger across the paper as if pointing to comic book frames. The drawing provided a couple of characters, but a much broader and more fully populated world would have been improvized in the moment. He then stuck the picture to the wall with blu-tack. Jo came in and I read them both a story from a Pokémon annual – Jo correcting my pronunciation of the creatures’ names. A: (pointing at an intensely scribbled part of his drawing) if you look very carefully you can see his eye – look! J: It’s an orange dot! A: Yeah. Jo is drawing too, off camera, but the microphone picks up his chatting and rummaging through the box of pens and crayons. Alex flips his paper over. A: (indistinct) … use the other side of the paper … I bet it’s another Pokémon what it evolves into. This ‘evolution’ is an important aspect of the game and attendant stories as each creature is located within a short chain of transformation that is, strictly speaking, closer to the metamorphosis of insects and amphibians than the evolution of a species. For instance, every Pikachu evolves from a Pichu and into a Raichu. The two stages of the transformation are being pictured on either sides of the paper. Alex draws a bold zigzag line across the page, then a straight line lengthways along the middle of the zigzag pattern. A: Look, his teeth has got a line across it. He flips the paper again and counts the angles in his zigzags. A: This one has four teeth, but this one (he flips the paper and points as he counts) has 1, 2, 3, 4, 5, 6, 7 teeth! Jo is in shot now, drawing what looks to me like a ghost. A plastic Pikachu toy looks on, smiling enigmatically as Jo sings quietly to himself. A (off camera): And this is what it evolves into. It has teeth. All Pokémon have teeth don’t they. A: Pikachu can bite, can’t he! J (pointing at his drawing): Look at that! It’s a jellyfish Pokémon! A: Wow, that’s a cool one. J: It’s Tentacool. A: Tentacool! J: Remember Tentacool? A: Oh, yeah. The talk for the next couple of minutes ranges over a number of Pokémon-related concerns, returning periodically to Tentacool and the nature of tentacles. A (referring to his drawing): It has bigger eyes too, than what it evolves into. It looks like a Tyrannosaurus Rex. A: Yeah, but it has tentacles. On its head it has tentacles! A: … is that really what tentacles look like? In this sequence, the drawing is not driven by the dramatic generation of particular Pokémon and their world, but rather by an intense exploration of physical attributes – teeth, then tentacles. The tentacles are closer mimetically to the images of Pokémon in the boys’ games and comics, whereas the huge teeth seem to emerge from Alex’s own immediate concerns, as – though technically monsters – Pokémon tend to be cute in appearance and not particularly fearsome. The drawing, then, is perhaps a touching or tracing of the contours and features of these compelling creatures, a summoning. Like Douglas’ battles, bringing together ‘a visible, concrete reality with a symbolically constructed reality’ (Feinburg 1976, 591). A little later the drawing begins to spin out into gestures beyond the page. Alex has drawn a fish-shaped creature. A: It’s a Powerfish! (not an actual Pokémon). Because it’s got a… (he swirls his pencil around the fish’s tail) … because its tail spins around! So it swims! A: Twirling around! J: Or up and down? A: Twirling around. A (sings): Twirling around, twirling around, twirling, twirling, twirling around. Jo is holding a small bird Pokémon toy up for the camera – Pidgey I think. A: Guess what Pokémon I am! A: I’m small … and spiky. (He bounces up to me on all fours). J: Primape! Alex bounces off again, fists held up in a simian gesture. A: Primape! Primape! (It is a feature of Pokémon that their vocalizations are only their own names or abbreviations of them. Pikachu says ‘Pika! Pika!’ for instance). A: Primape does do this, doesn’t he. Jo joins in the jumping and Pokémon-guessing game. J: Try this one: what is small and has a flower on top? A: Don’t know. J: An Ivysaur. A: Oh, yeah. Jo jumps on Alex and pins him to the floor, Primape and Ivysaur jumbled up in the rough and tumble, dissolving into an occasional shout or gesture. At some point it becomes apparent that Primape has been replaced by Pikachu and that the botanical Ivysaur must have evolved into its next stage: Bulbasaur. J: Bulby! Bulby! A: Pika! Pika! Thirty seconds later the camera is switched off as the rough and tumble turns into an actual fight. Play with Pokémon games continued intensely for some years, with the GameBoy and Nintendo DS games returned to occasionally even when the boys were teenagers. A set of drawings produced by Alex at around the age of eight demonstrate an imaginative and processual engagement with the gameness of the Pokémon world, as well as its personalities and plots. The creatures are depicted, and new ones invented, as, at the same time, dramatic characters and as game elements. They are given the numerically valued attributes and abilities of the card and computer games. At times he created full sets of tiny cards, complete with a uniform abstract design for the obverse sides (Figure 4.2). There are echoes here of other spontaneous moments of meta-play, a playing with and framing of games and performances that appears to be fundamental to play (see Chapter 7, ‘Real Worlds’), but which is particularly evident in play with the existing frames, screens and micro- worlds of contemporary media.